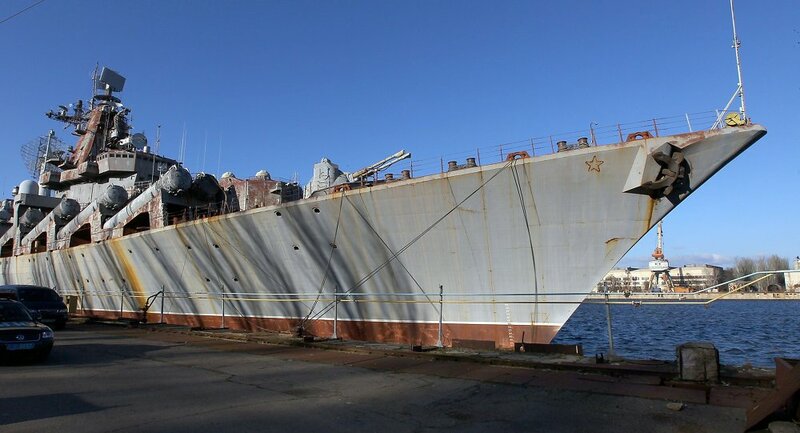 On March 26, it was reported that Ukrainian authorities will be scrapping the incomplete Soviet-era missile cruiser "Ukrayina" (Ukraine), which has been sitting docked at the harbor of Nikolayev. 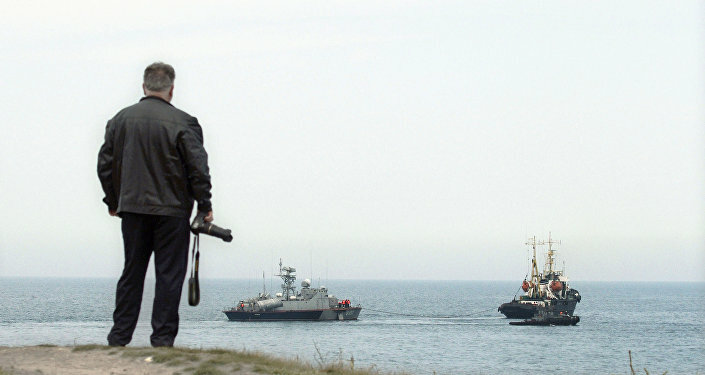 According to Vyacheslav Bon, deputy head of the Nikolayev regional administration, President Poroshenko signed a decree to demilitarize and sell off the vessel. The decision has already been agreed upon with the Ukrainian Defense Ministry and the state-owned group of defense companies Ukroboronprom. "You have the cruiser Ukrayina sitting in your docks. A presidential decree on its demilitarization exists. If your remove the weapons and sell what's left, that will be enough to pay your back wages, and three times that left over. The ship has a frame and turbine engines, they are in demand," Bon said during a meeting with workers at the 61 Communards Shipbuilding Yard. As of March 1, workers at the shipyard were owed nearly $1.8 million in unpaid wages. The Ukrayina was laid down in 1983 and launched in 1990. After the collapse of the Soviet Union, budget constraints compelled the Ukrainian Navy to halt work on the cruiser. Since that time, the ship has remained unfinished, with some $30 million needed to complete the construction. "To some extent, the Ukrayina resembles the Flying Dutchman. Many sailors claimed they saw her but in fact the ship was a ghost. On the contrary, the Ukrainian cruiser is real but was never seen sailing the sea," Radio Sputnik contributor Vladimir Filippov wrote in an op-ed for RIA Novosti. According to the author, the situation with the Ukrayina reflects the disastrous state of affairs in the country’s shipbuilding industry. "After the breakup of the USSR, Ukraine inherited a capable shipbuilding yard in Nikolayev as well as facilities in other regions. Ukraine had everything to become one of the global leaders in military and civic shipbuilding. But now the Nikolayev shipyard is on the verge of bankruptcy," Filippov wrote. The Nikolayev shipyard as well as many other Ukrainian defense manufacturers have been hardly hit by the disruption of military and technical cooperation with Russia. After the Maidan coup in 2014, many joint projects were suspended or cancelled, with Moscow forced to cancel orders for some Ukrainian-made parts and components. Commenting on the situation, Russian presidential aide Vladimir Kozhin said recently that the disruption of Moscow-Kiev military and technical cooperation has ruined the Ukrainian defense industry. "[The breach of cooperation] destroyed plants in Ukraine and left thousands of engineers jobless," Kozhin told Rossiya 24 broadcaster. Filippov argued that the Russian military predicted the chaos and this is why shortly after the fall of the Soviet Union Moscow bought Soviet strategic bombers from Ukraine and withdrew nuclear weapons, in accordance with international treaties. "Now, radical forces are calling to restore Ukraine’s nuclear status. However, Washington will never let that happen. Despite its anti-Russian rhetoric, the United States understands that this is a matter of global security. Moreover, why would Ukraine need nuclear weapons?" the author pointed out.